Every Thursday at 7pm - $30 per person No Experience Necessary - Let’s Paint! 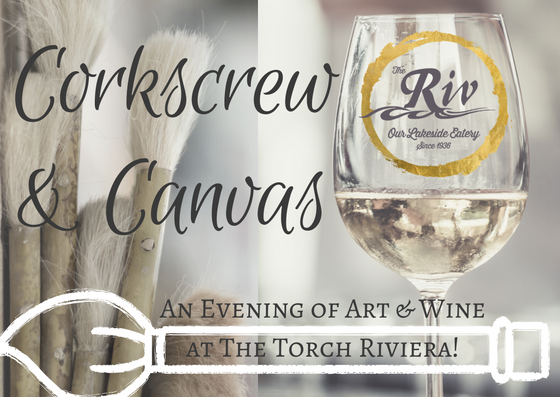 Join us at The Torch Riviera for an evening of Art, Wine, and Friends. Are you ready for an amazing experience? This workshop is a great way to have fun with friends, meet new ones, relax and let your hair down, or simply discover your inner artist. Come on in, sip a glass of wine, and paint along with host and owner Chelsea Kline to create your own work of art that you can either take home at the end of the evening or donate to Patriot Place, a local transitional house for displaced veterans. They are always looking for art to adorn and warm the walls! We are a local, family-owned operation that takes pride in our roots and our community. We believe in supporting local growers, brewers, vintners, and producers of all kinds as much as possible. Our Chef and owner Ben Kline serves up fresh, quality food in the spirit and tradition of Northern Michigan. Come see us down at the south end of Northern Michigan's infamously beautiful Torch Lake to experience the amazing tastes our area has to offer.